Hello, my name is Joe Baldwin, I'm a digital designer and web developer based in the UK. Gooberlicious is my online portfolio space. With a background in commercial art and over 15 year's experience in web development I have the skills and attention to detail to bring your project to life. I speak fluent ‘Art Director’ and ‘IT Engineer’ enabling me to translate any idea into great digital work. I've been a freelancer in one way or another since 1993 aside from a five year stint with Ogilvy (even then I was running my own Web development company in the evenings). In that time I've built up a considerable body of work and some very happy clients. I enjoy the challenges of working for small local businesses as much as blue chip clients and global ad agencies. 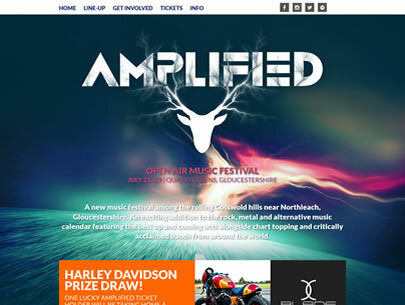 Site design and production for Amplified Open Air Festival. The project involved the site design and development, online marketing efforts, newsletter design and e-mailouts. 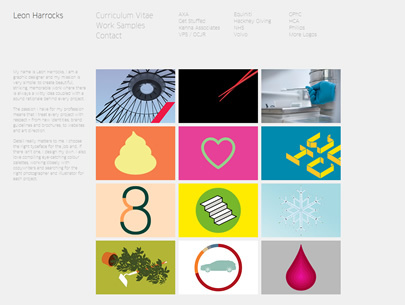 The site is built using Concrete5 CMS for simple WYSIWYG editing. 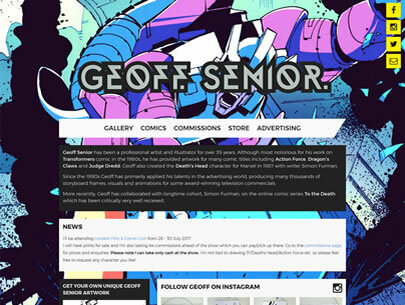 Geoff Senior required a new site to showcase his comic-book illustration and fine art. The design is responsive using Bootstrap and Concrete5 CMS for easy updates and a user-friendly experience on all devices. Treehouse24 are a pre-production visualising, storyboarding, animatic and animation studio for the advertising industry. This CMS-based site is touchscreen-friendly and delivers a range of multimedia content in a creative and intuitive design. 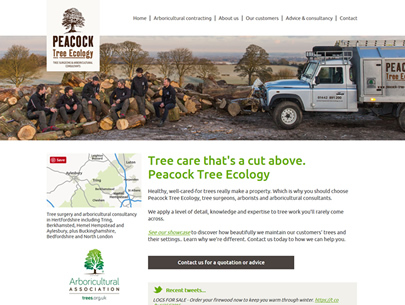 I was recommended to Peacock Tree Ecology, by another client, to redesign an under-performing site. I redesigned and rebuilt the site to focus on client-needs and SEO. It's based on a fantastic WYSIWYG CMS that makes updates quick and easy. I also set up social media and a blog which they have taken to like pros! Since the update there has been a significant increase in enquiries. 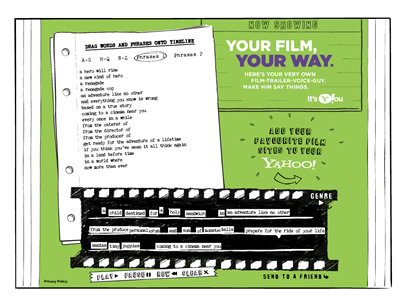 Working with designs from OgilvyOne I developed this fun Flash app for Yahoo Movies. Using a clever drag and drop interface and some nifty audio sample sequencing you can record and share your own creative movie trailers. Traffic was generated by a condensed form of the app running in a banner on IMDB. This portfolio site for talented designer Leon Harrocks features a CMS for easy updates and responsive design for optimised display on desktops, tablets and mobiles. 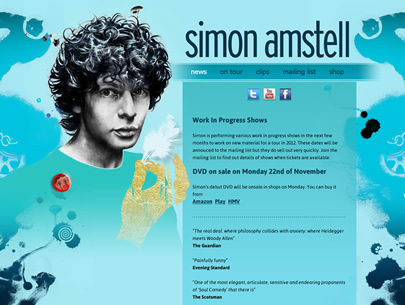 This site for actor and comedian Simon Amstell was built using a WYSIWYG CMS system to enable quick updates with minimum training. I had previously worked with Mike Owen and Jon Chandler when they headed BrandHealth International. I developed the original website and helped with all digital marketing communications. 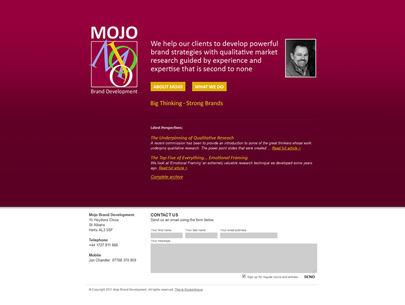 When they struck out on their own with Mojo Brand Development they asked me to do the same. The site is CMS based and includes a growing blog-styled article repository. 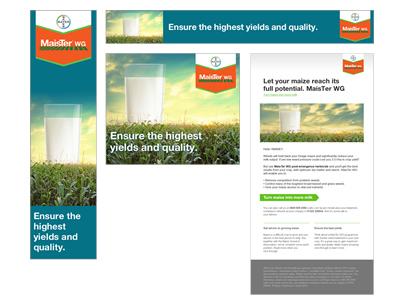 I have art directed and produced a huge amount of online advertising for Bayer Crop Science including HTML5 banner advertising campaigns, eMail marketing, microsites and website updates. I worked closely with HiveB2B to deliver all aspects of digital work for this voice and data recording solutions provider. Work included rich media banners, email marketing and web development as part of a broader integrated campaign. 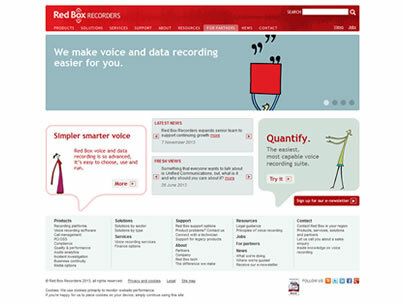 The Red Box Recorders website was redesigned using a CMS framework that allows WYSIWYG editing and a private ‘partner area’ that alerts global partners to the latest downloadable software updates and information. If you like what you've seen and would like to see more or have a project that you’d like to discuss please contact me by email or phone.